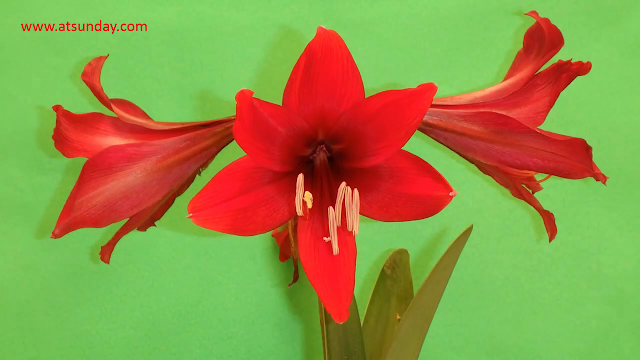 This video consists of several photos when the red amaryllis is blooming. Then followed by a video recording from close up distance showing the inside of the crown (corrolla) with six petals. We can see clearly stigma and style as part of pistil. 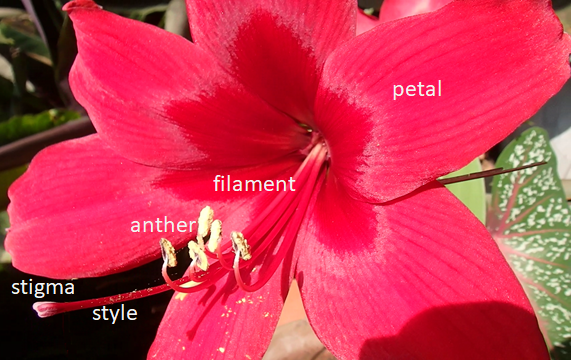 Also we can see anther and filament as parts of stamen. According to the consensus of botanists in 1987, this type of flower plant was called hippeastrum, not amaryllis. With the species full name is hippeastrum puniceum. But the amaryllis name is already famous. As can be read on Wikipedia. Hippeastrum's name is given by William Herbert which means "Knight's-star-lily". Over the years there has been confusion among botanists in the generic name of amaryllis and hippeastrum. One conclusion is that the common name "amaryllis" is actually genus hippeastrum, often sold as indoor flower bulbs especially on Christmas in the northern hemisphere and popular as Christmas amaryllis bulbs. As of November 2013 Hippeastrum was recorded to have 91 species. Usually the most expensive price is the double petal varieties, the flowers are double in one petal so that they resemble roses. Amaryllis is also known as: belladonna lily, jersey lily, naked lady, amarillo, easter lily in southern Australia, march lily in South Africa. In tropical environment such as in Jakarta, this hippeastrum plant is easy to maintain. Hippeastrum likes direct sunlight to make it diligent in flowering. Although it can live in the shade or indoor, but it will be difficult to flower. Photos of blooming flower are put together to become a video, taken from around 7:00 to 13:00. With an interval of taking photos every 10 minutes. See also the bloom of four pink amaryllis flowers.